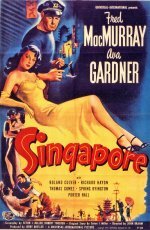 Pearl-smuggling sailor Fred MacMurray returns to Singapore after the Second World War to retrieve a valuable bag of pearls he left hidden in his hotel room. In flashback, he relives his romance with Ava Gardner, apparently killed in the Japanese invasion which coincided with their wedding. Back in present time, he discovers her alive but suffering total amnesia and married to wealthy Roland Culver. A familiar formula farrago, directed by John Brahm and combining romance, melodrama and thriller elements in an exotic setting, this much-derided piece of nonsensical escapism is really quite entertaining and could be a lot worse. Gardner is wooden but ravishing, MacMurray a solid and convincing presence. Remade in 1957 as Istanbul with Errol Flynn.